This rear garden is a secluded, north facing private space, ideal for catching winter sun in the adjacent artist’s studio and for dipping into the pool in the summer heat. French doors open out from the rear of the house onto a solid stone terrace, linking inside and out. Generous stairs then lead down to the main entertainment area of the garden comprising of pergolas, a swimming pool and a design studio. 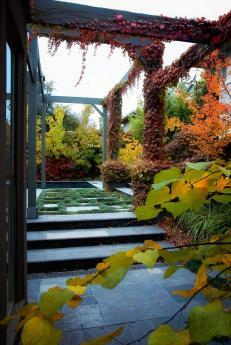 The central pergola is veiled with a deciduous vine of Boston Ivy under which a timber and stainless steel furniture setting lies. This space is suitable for outdoor entertaining in winter sun or summer shade, as well as the nice days and nights in between. The soft landscape has seasonal longevity. Masses of scented white blooms profuse in spring, verdant foliage holds through summer, shifting to brilliant reds and oranges in the autumn, then as winter settles in, the bare lacework of branches make their own architectural statement. The artisan owner creates jewelry in her outdoor design studio and never tires of the changing moods of the garden.